Hi all, we are really excited to come to you with a new product, that our team at Opera has been hard at work on. Opera Touch is a brand new mobile browser. We have designed it to be used on the move, and with just one hand. 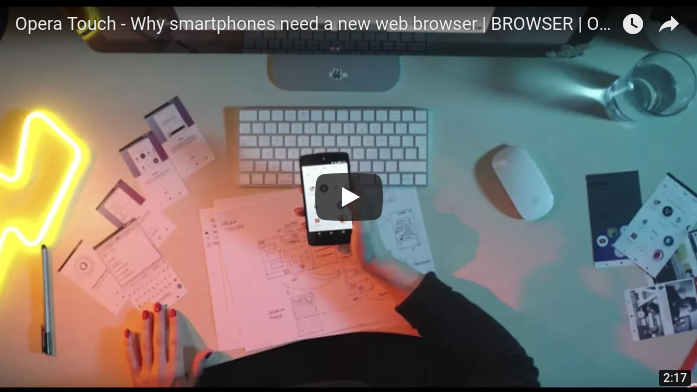 It also makes the mobile, and desktop web browsing experiences into one, with a feature we’ve named Flow. 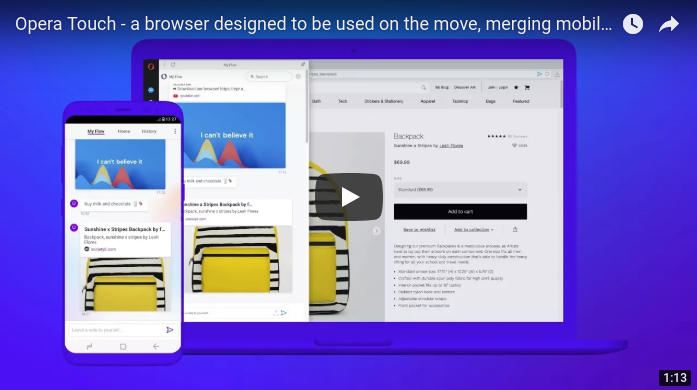 When we started working on Opera Touch, we realized we needed to bring you a browser designed from the ground up, and which fits the way you actually use the web: on the move. We also wanted you to be able to easily move content between your smartphone, and your laptop. 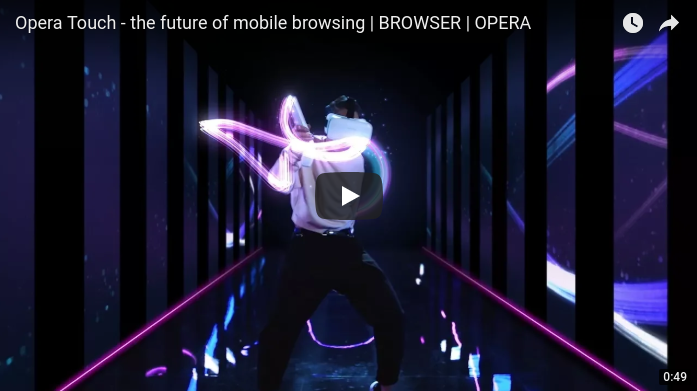 That’s why, today, we are also releasing a new version of the Opera browser for computers, which Opera Touch seamlessly connects with. Without bragging too much, we are actually introducing a new type of web experience. According to research we conducted on a large group of U.S. smartphone users, 86 percent of them prefer to hold their smartphones, with one hand, while also doing other stuff, such as: eating, commuting, walking, or shopping. Well, while you will probably agree, that this is the way you use your phone, the problem we discovered in conventional mobile browsers was, that they typically require people to use both hands to type in a query, or a web address. That’s uncomfortable. 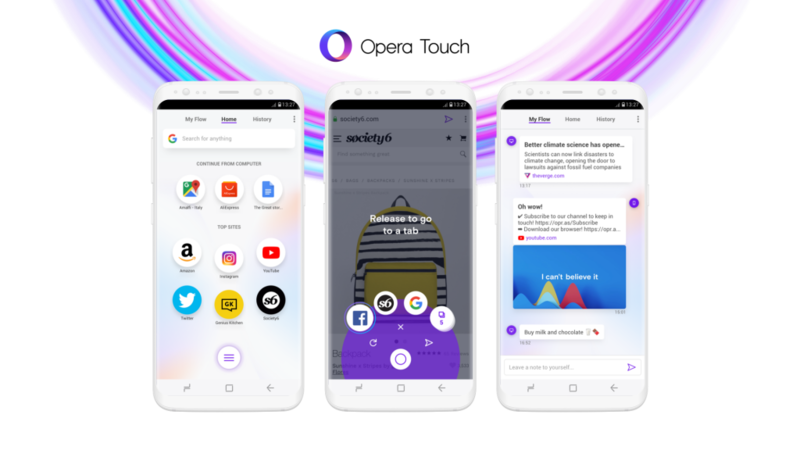 We created Opera Touch, with this large crowd of people in mind – ones who even sometimes drop their phones browsing, because they can’t reach all the way to the top of the screen. Ok, we used to be those people too. That’s what got us started on this project. So what is different in Opera Touch? First of all, we have worked on browser navigation, and designed it to be used with just one hand, which gives you a more comfortable experience, while browsing the web. How we did it? Well, we actually moved the browser’s key functions within your thumb’s reach. This means that, unlike in most other browsers, you can now more easily browse, and search the web when on the move. Just imagine: you can keep eating your ice cream, or a slice of pizza, or walking with your dog, while getting the full web browsing experience in your other hand. 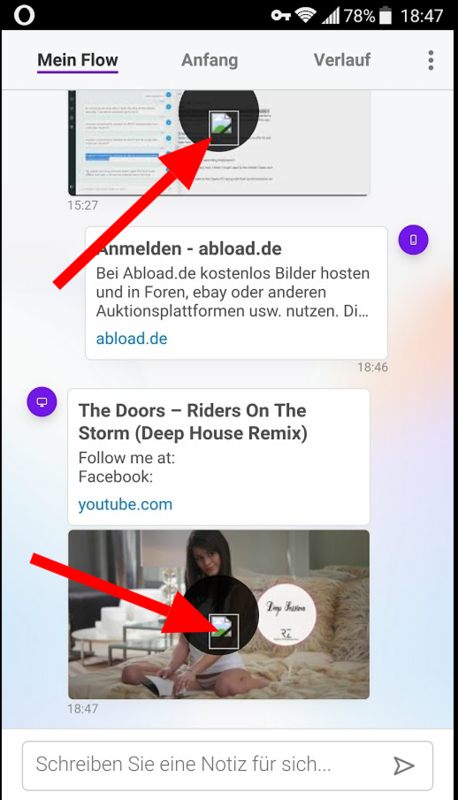 The first thing you will notice in Opera Touch, is that the browser starts in search mode, and is instantly ready to find things for you on the web. The keyboard is up, and the address bar cursor is blinking. With Opera Touch, you don’t have to make any additional moves, or taps before you can start searching. That’s because we know you usually want to quickly find something online, and move on with your life, or that your other hand might be holding that ice cream. That’s why we’ve reduced the number of steps, before you can start your search to zero. Guess what? In our new browser, you don’t even have to type in order to search the web. You can also use the voice search function, or scan a QR or bar-code to perform your search. That’s a useful function, when you for instance see a product at a shop, and want to check its reviews, tutorials, or prices online. The big button at the bottom of your browser screen, is what we’ve called the Fast Action Button (FAB). The neatly designed FAB is always available on the browser screen, and gives you direct access to the most recent tabs and search features. You can also close a tab with it, and send a web page to Flow (more on that below). It simply allows you to navigate through all of the browser’s features, with just your thumb. Do you ever find yourself e-mailing, or messaging yourself or your loved ones, just to save a link for later reference? Well, you’re not alone. According to the survey we already quoted earlier, 65 percent of users end up doing just that – even if they just wanted to save the link for themselves. But why do they do that? Because syncing is often too problematic, and takes as many as 13 steps to set up. Well, with Opera Touch, this will no longer be your problem. We’ve actually invented a life hack for you, to keep your images, links and videos, that you just want to safely share with yourself. 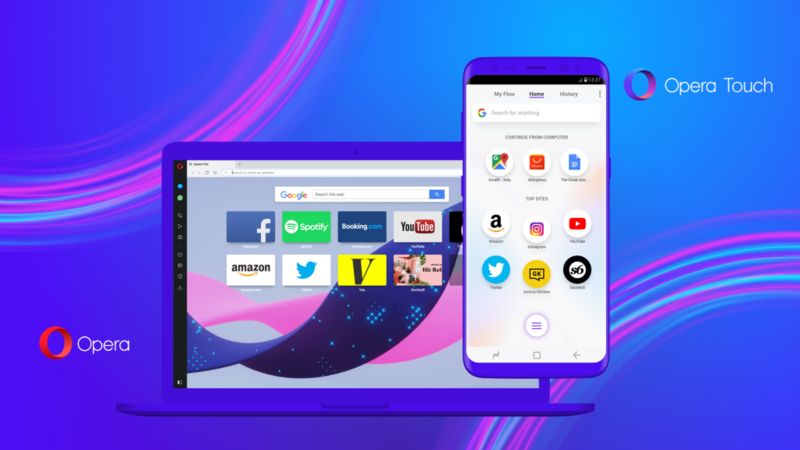 We’ve called this feature Flow, and the good thing of it is, that it only takes one step to set it up, and establish a connection between your mobile and PC browser. 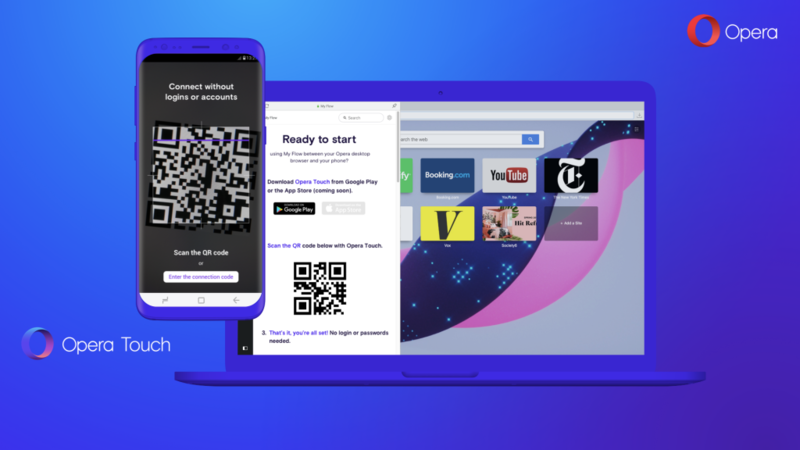 This one step, which consists of scanning a QR code, displayed in the Opera computer browser with Opera Touch, establishes a Flow, our innovative way of allowing you to share: links, images, videos, or notes with yourself. Flow is available both: in Opera Touch, and in the updated version of the Opera PC browser. And the good news? It doesn’t require any logins, or passwords. At the same time, it’s end-to-end encrypted and safe. So now, whenever you add an item, such as a scan of medical results, or a website with top restaurants to check out, to Flow on one device, the other one instantly sees it. The other cool part is that to use Flow, you don’t need to own devices from the same manufacturer. Did you watch our live launch event? We certainly hope you did, but in case you missed it, you can re-watch it here, and also, you can download the newest version of Opera for PC as well as Touch from that very same page: www.opera.com/r2. 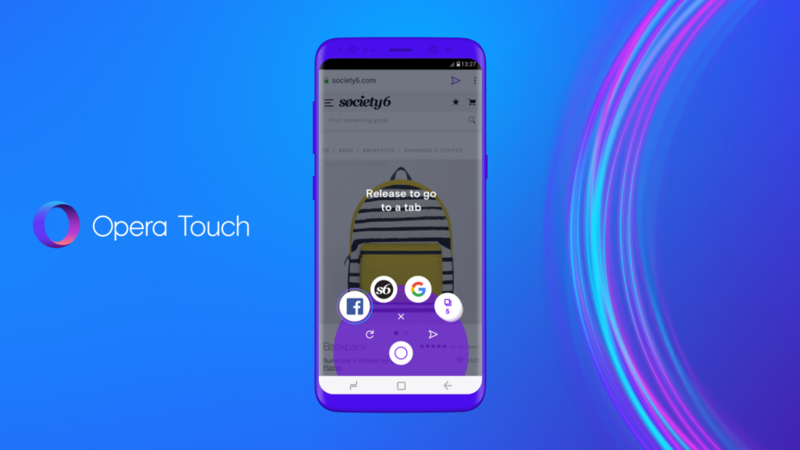 Opera Touch is a free app, available for Android on Google Play, and will be coming to iOS soon. To make full use of the Flow feature, download the latest Opera browser to your Windows, Mac or Linux PC. We hope you love Opera Touch, just as much as we do. Looking forward to your feedback! I can see the early potential of Opera Touch. I generally like the page rendering and prefer it to that of Opera for Android but it isn't perfect, some pages don't resize correctly, such as my Yahoo email and need to be sideways scrolled to read. I get en error message when I try to enter my Facebook inbox. One of the advantages of Opera for Android was that it did not force direct you to install the Facebook Messenger app. Although fanfare is made about "Flow" it is not something that I have a need for. Upon first use and skipping connecting to a desktop browser the app has said it will remind me again tomorrow. I hope this does not turn into an annoying spam/nag and can be totally disabled if the user wishes. I would like to make full use of the possibilites of Flow, but it seems to be limited to only one, non PC device, as I can activate my phone but not my tablet. Also, some test images I sent from PC to phone just sit there within the flow area of the browser with no way to download them onto the phone. Any help? Thoughts? Comments? I have a problem, the passwords of opera desktop are not synchronized with opera touch, someone with the same problem? I think the new browser might be a really good one and I'd like to use it as I'd like to use opera mini. It seems to be that there isn't any option for changing the defualt search engine at all, is it? If there wouldn't be any possibility to change the search engine I have to stay on the 'normal' mobile opera browser. I'd be glad if someone could help me out here or supports my wish for changing the default search engine. Nevertheless I have to say that the Opera community does an awesome job and I enjoy browsing the web every day due to Opera and its perfect handling. @jimspriggs Yes, I have the same issue...I want to be connected with Flow on my home and on my work PC. Flow is completely useless for now. I hope they are aware we live in 2018 and most users have more than 1 device at home lol. If I can connect only 1 device with my phone so... what's the point? @giordanioo @jimspriggs Same here. I love Opera Touch so far, and the Flow feature is fantastic (in theory). I just simply have too many devices I want to link together for it to work in practice. Personal phone, work phone, tablet, personal laptop, home PC, work laptop, etc. Would love to see it synched between all of my devices, not just two. @djscream3 There's no sync in Opera Touch. @leocg There was no password sync in Opera for Android as well, so it is not new. Is there any chance that with Flow we can retrieve the connected PC's bookmarks (including Speed Dial) ? It will be a fair fallback for the No-SYNC choice in Opera Touch. Because yes, there are still unrememberable URL that I want to access with my phone/tablet. Well, to be honest, I cannot understand why the Flow and FAB weren't incorporated to Opera for Android and the Touch was developed instead. The Touch is completely redundant as I see it and I'm not alone. Look at reviews on Google Play. I'm disappointed. Very interesting idea. But the package requires the version of Android 5+. Is it possible to build a package for Android 4.4? I like the new Opera Touch. But missing text wrapping, etc. Now, there are still some pages that are displaying because it does not show a full resolution in the desktop view, but top left corner. Please bring back Opera Coast swipe to back and forth gesture feature in Touch. Connecting to PC Opera does not work: "Failed to connect" shows on both Android device and Desktop. Opera, Opera Mini, Opera Touch ... it would be nice to know for whom which version were created, in which features they differ etc. - maybe even in the short description in the Google Play Store. I now have them all on my device and don't know when to delete which.